Gardeners will go to extraordinary lengths, sometimes, to prevail over Mother Nature. I wish I could take credit for inventing this contraption, but I cannot. I saw it in a recent issue of Fine Gardening. I like blueberries, but I live with someone who LOVES blueberries. I can’t grow many food crops because of the deep shade that covers most of my garden, but in this 15′ square little plot off the edge of our deck, I manage to grow three little blueberry bushes. The rest of the space is a large nursery bed for everything else I’ve acquired but don’t know where to put. Blueberries are a painless plant to grow, but saving the fruit from our woodland neighbors is not so easy. In the past I have put up tall tomato stakes and attached netting to them, but my technique with this equipment is insufficiently refined. Tired of entangling myself in bird netting every time I wanted to harvest, I knew when I saw this article in a recent issue of Fine Gardening, I had to act. The walk-in cage (that doesn’t sound dodgy at all, does it?) is made of 8 lengths of 8 1/2′ long, 1/2-inch PVC pipe, joined at the top by a 90-degree elbow. The uprights are anchored in 1-foot lengths of 1-inch PVC, hammered into the ground. The bird netting is anchored onto the frame with twist-ties. The whole edifice cost less than $20 at the local hardware store, and the only tools I needed were a hammer and a small saw. If it’s going to be like that, we’ll see who gets the blueberries on her cereal. 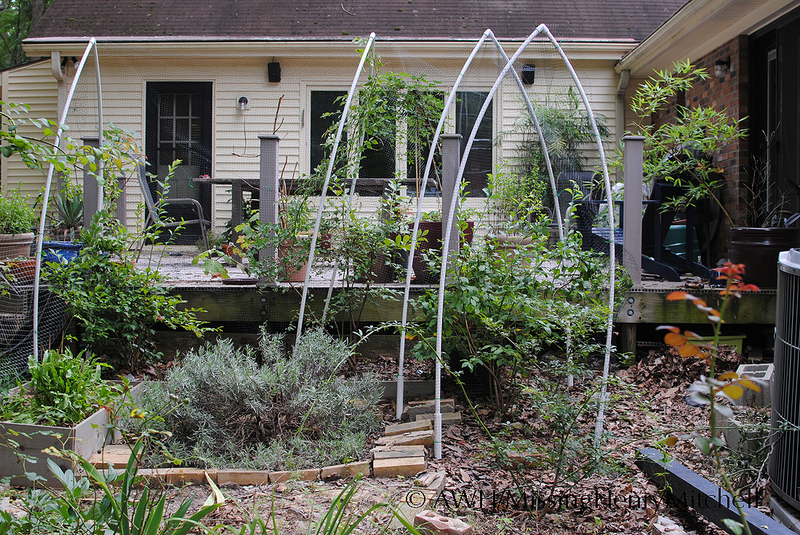 This entry was posted in 2013, Garden wildlife, Projects and tagged blueberries, Fine Gardening, garden wildlife, growing blueberries, growing food at home, growing fruit at home, shrubs by missinghenrymitchell. Bookmark the permalink.